Outside the daffodils and forsythia were blooming, but the group assembled in Nashville, Tennessee, hardly took notice. At the GAP-Net Site Optimization Conference, held February 27–March 1, representatives of 61 academic and private clinical trial sites had eyes and minds trained on efforts aiming to improve how Alzheimer’s disease clinical trials are done—and after years of prep work, some of those efforts are starting to blossom. The changes come as the field needs to get ready for rapid growth prompted by impending Medicare changes for cognitive screening reimbursement. Sponsored by the Global Alzheimer’s Platform (GAP) Foundation, this meeting convened trialists to mingle, exchange notes on what works and what doesn’t, and learn from each other. Most of the 160 attendees labor on the front lines of AD clinical trials—and their meeting emphasized practical and operational issues. Part 1 of this series focuses on recruiting; Part 2 reports on speeding IRB reviews and other issues. GAP-Net launched in 2016 with the goal of reforming AD trials. In Nashville, the group took stock. Its leaders declared success with targeted help for sites to recruit participants locally, with a central IRB to cut down start times, and the deployment of GAP liaisons who run interference between sites and sponsors to keep everyone in step. And its foot soldiers networked. In panel discussions, presentations, a barbecue dinner with live country music, and a speed-dating-style brainstorming session, the group generated more youthful energy than a typical research conference. Three years ago, GAP Foundation cofounders George Vradenburg and John Dwyer conceived GAP-Net to re-engineer the painfully slow, inefficient processes and systems underpinning Alzheimer’s disease drug evaluation (Aug 2016 conference news). A private foundation, GAP worked to raise money from charities and pharma companies to speed the pace of testing of new treatments for AD (Cummings et al., 2016). They initially sought to boost web-based recruiting of research participants, promote new trial designs, and raise more funds for research. Then, GAP proposed to establish a standing clinical trial network in North America that would use common procedures and dedicate itself to increasing the speed and quality of AD trials. GAP-Net now encompasses 73 sites—32 academic and 41 private—supported by staff at the GAP Foundation (see site list). GAP brings a business consulting style and analytic eye to every aspect of trial conduct, from recruitment and retention to financial management, data handling, and research quality monitoring. This scrutiny and support for continual process improvement distinguishes GAP-Net from other AD trial networks in the U.S.
GAP-Net currently participates in three drug programs involving 48 of its sites. TRAILBLAZER is Eli Lilly’s Phase 2 test of donanemab, aka N3Pg, an antibody targeting pyroglutamate-modified Aβ; half of the TRAILBLAZER sites belong to GAP-Net. GAP did not disclose the others, but their descriptions fit TANGO, Biogen’s Phase 2 trial of its anti-tau antibody BIIB092, and Graduate, a Phase 3 registration study of Roche’s anti-Aβ fibril antibody, gantenerumab. Dwyer reported that GAP is considering requests to facilitate several more trials. Last year, the well-documented, urgent need for faster trial recruitment made headlines in The New York Times. Despite the growing prevalence of Alzheimer’s disease, 90 percent of AD trials report delays in filling their quotas (Armstrong and Turek, 2018). For many other diseases, doctors refer patients to trials right after a diagnosis. In AD, most current trials seek volunteers with only mild symptoms or none, but very few physicians who care for aging patients include memory screening in routine checkups (Mar 2019 news), or are primed to encourage trial participation at the earliest stages. Recruiters have to reach out locally or on the internet to find volunteers. However, after a decade of enthusiasm for building online registries, making them effective still requires refinement. 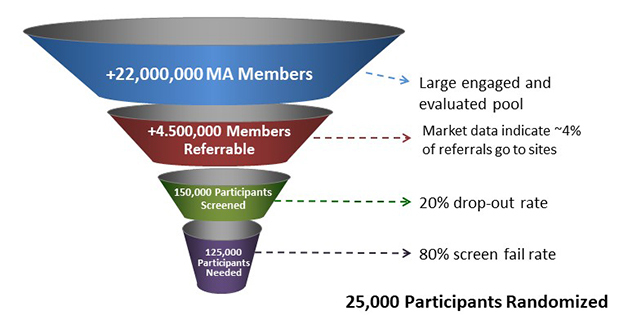 According to GAP’s calculation (see image below), only one in 1,500 people reached via an online registry make it through the selection process and satisfy the requirements to enter a clinical trial. By that math, trial sites would need to make contact with 37.5 million people to find the 25,000 required to fill the current batch of Phase 2/3 trials. More and better approaches to recruitment are clearly needed. One solution may be emerging from Medicare. Upcoming changes in Medicare payments promise to create for the first time a financial incentive to identify and treat people with dementia, Dwyer said. In 2018, approximately 22 million older Americans enrolled in Medicare Advantage (MA) plans, which offer benefits through private insurers. The federal government pays MA insurers an annual lump sum per enrollee to provide care. This payment is calculated for each participant by a complex clinical risk model. If a person has diabetes, or high blood pressure, their allowance ticks up; for someone in good health, it is less. Dementia has not been part of this formula, but starting in 2020, Medicare will incorporate two new risk categories, for dementia with and without complications. These diagnoses will prompt payments to private insurers of between $2,000 and $6,000 per year per patient. This means $4 billion will enter the system annually, tied to diagnosing and treating dementia. Between cognitive health and dementia are millions of people with presymptomatic or mild cognitive impairment due to Alzheimer’s, whom treatment trials are desperate to find. How the new Medicare rules will affect them is unclear, Dwyer said, but he sees a hopeful trend in the growing number of Medicare Advantage plans that offer brain health benefits. Combining physical fitness activities with online cognitive exercise, these programs attract people with concerns about their memories and the “worried well.” Dwyer estimated that the combined effects of increased screening, diagnosis and access to people with memory concerns will add up to 4.5 million new prospects for early and later-stage clinical trials (second funnel image, above). GAP will try to steer newly aware Medicare members and their families toward treatment and prevention trials. “We can work with insurance companies to get information about research/clinical trials in front of these people, and we can access people who are using new brain health/mental fitness benefits with info about clinical trials,” he said. Meeting participants readily agreed that large, national advertising campaigns by sponsors without support for sites are unhelpful. They tend to generate hundreds of phone calls that overwhelm a site’s capacity to promptly respond, yet yield few participants. More effective recruiting occurs locally, site clinicians insisted, and they demanded support for this work. Gregory Jicha, University of Kentucky, Lexington, claimed that less than 10 percent of people in clinical trials come through sponsor-supported mechanisms, and 90 percent are brought in using money that sites have to come up with themselves. Jicha suggested that rather than spending 90 percent of the recruiting budget on national media, drug companies fund sites directly to recruit. “Our participants come in at the site level. That’s where money needs to be spent, and that’s where we’ll make our impact,” he said, drawing applause. Centers also want support for continuous outreach that is not study-specific. “Sponsors should know that a rising tide of recruitment will lift all boats,” said Mark Brody, Brain Matters Research, Delray Beach, Florida. Ask Me About My Trial. GAP-Net distributes pins to trial volunteers help spread the word about clinical research. GAP supports local recruiting for the three GAP-enabled trials and sites’ general recruitment efforts. These small grants have worked to drive up enrollment, several attendees agreed. Sometimes, what works is as simple as buying food for community events. At Butler Hospital in Providence, Rhode Island, GAP supported the salary of an outreach coordinator who organizes community events and recruits volunteers for the hospital’s “swab squad.” These volunteers set up at community events to collect cheek swab DNA samples for ApoE genotyping (Dec 2017 conference news). According to Bill Menard of Butler, a small grant from GAP brought down outreach costs and the time clinical staff spends at community events, while increasing capacity. GAP has developed advertising programs that any site can join. The foundation and its partner UsAgainstAlzheimers provide all GAP-Net sites with personalized advertising materials including videos, postcards and a flyer in English and Spanish promoting research participation as part of a brain health campaign. Another advertising toolkit focuses on AD clinical research. A Citizen Scientist Award formally recognizes patient’s contributions to AD clinical trials. Sites nominate study participants, and national winners are honored at the GAP Foundation Gala held every fall. Another effective recruitment strategy is bringing research to where the patients are, said Lisa Sonneborn, Clarity Clinical Research, Syracuse, New York. Her site takes on trials that are notoriously hard to fill, seeking people with AD-related psychosis or end-of-life AD. Sonneborn’s group forged a partnership with a nonprofit nursing home chain that cares for 8,000 patients with AD/dementia in 19 facilities across upstate New York. The nursing homes gain Clarity’s educational programs and the opportunity to market themselves as leaders in AD research, while Clarity gains access to potential study participants, and also to family members, who are likely volunteers for prevention studies. The chain has a 20-person marketing team to deploy toward local TV, newspaper, and radio exposure for the research trials. The nursing home company currently is building a dedicated research space in one home for Clarity’s use. “With the right partners, this model could be used elsewhere,” Sonneborn said. Gustavo Jimenez-Maggiora, Alzheimer's Therapeutic Research Institute, University of Southern California, Los Angeles, updated the audience on ATRI's Trial Ready Cohort for the Prevention of AD initiative (Aug 2016 conference news). Called TRC-PAD, this has been slow in coming. TRC-PAD aims to establish a standing cohort of 2,000 trial-ready volunteers, 1,000 with preclinical and 1,000 with prodromal AD, for rapid start-up of prevention trials. The initial plan calls for enrollment of 50,000 potential subjects into the Alzheimer’s Prevention Trial web study, which is collecting longitudinal cognitive and other data via the internet. From that pool, 35 planned TRC-PAD clinical sites will select a trial cohort at high risk of developing AD, using an algorithm including biomarker data, clinical status, ApoE genotype, and other factors. The web study launched in December 2017, and as of February 2019 has 13,506 registrants, Jimenez-Maggiora reported. Eight of the 35 TRC-PAD sites have been selected, and the first was IRB-approved in January 2019. He said the group expects the first in-clinic visits this spring. Many APT participants live far away from TRC-PAD clinical sites, and thus are unlikely to volunteer for the clinical cohort. To make participation in the web study useful for them, TRC-PAD is supplying participants with a version of their own longitudinal APT data to print out and discuss with their physicians. Jimenez-Maggiora said this may drive recruitment to clinical trials outside TRC-PAD. Cummings J, Aisen P, Barton R, Bork J, Doody R, Dwyer J, Egan JC, Feldman H, Lappin D, Truyen L, Salloway S, Sperling R, Vradenburg G. Re-Engineering Alzheimer Clinical Trials: Global Alzheimer's Platform Network. J Prev Alzheimers Dis. 2016 Jun;3(2):114-120. Epub 2016 Mar 4 PubMed.